Clients have been buying fire extinguishers from us for over 20 years. We supply all types of extinguisher at highly competitive rates and deliver, fit, and commission them absolutely Free of Charge. Not many people know that, when you buy fire extinguishers on the internet, you STILL have to have them commissioned by a professional. That means you can actually end up spending more when you wanted to spend less. When you buy fire extinguishers from us, you get more than just a new extinguisher – you get a complete, end-to-end service. 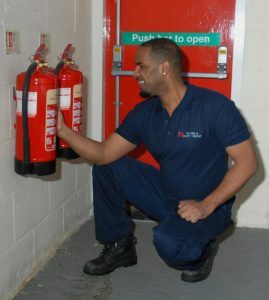 We make sure you are left 100% compliant with UK fire extinguisher regulations, not to mention insurance requirements. Our aim is to make buying fire extinguishers affordable, simple, and quick for all types of business, no matter how big or small. Call 0845 845 3001 today to buy fire extinguishers or arrange a FREE SURVEY visit from a BAFE registered engineer. We also give you a 5 year guarantee on every fire extinguisher you buy. Our engineers are all BAFE registered, which means they are regulated by a fire safety industry body. They also provide a free survey service if you’re not sure exactly which fire extinguisher you need. Why should you buy fire extinguishers from us? To get a quote to buy fire extinguishers or arrange a free survey, please get in touch with our friendly team by emailing info@surreyfire.co.uk, or calling 0845 845 3001. They’ll be happy to help.